Children’s Writers and Illustrators for Stories and Literacy (CWISL) has returned to London South Bank University (LSBU) to provide 100 school children from nine local schools with a window into the world of storytelling and literature. The ShoutSouth! 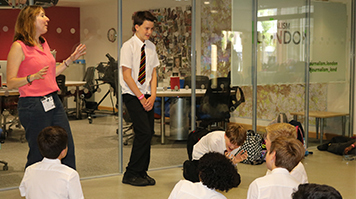 creative writing festival, funded by the Arts Council England Lottery Fund and Thomas’s Schools Foundation, connected the students with 16 authors to explore creating stories through a mixture of plenary sessions and smaller group workshops. Taking place over two days, the students explored all aspects of story - from the initial spark, to thinking about plot and character and using storyboards and illustration to playing with words that create rich meaning, and even body language explored through drama. The students used the knowledge gained over the two days to produce a finished piece, working in groups mixed across schools and age groups, sharing and celebrating their work with each other and with their parents. Beverley Birch, children’s author and founding member of CWISL, said: “Our aim is more books and their creators in our communities; fostering children’s creativity as readers, writers and illustrators. “Creative writing festivals for young people are hugely rewarding because we know how much the children love it. Find out more about upcoming events at LSBU. Kids discover their creative flair at ShoutSouth!